Indoor street art sounds like a contradiction in terms but that’s what’s on offer this month in Porto. 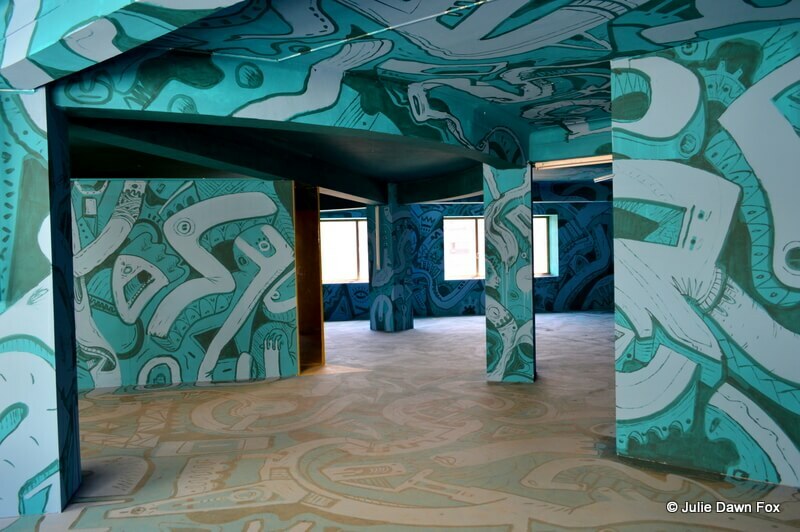 5 floors of the former AXA building in Avenida dos Aliados have been taken over by celebrated national and international street artists. Note: Although the exhibition is over, you can explore the best of Porto’s street art on this guided tour*. Of the 22 invited street artists in this exhibition, I think Costah got one of the best deals in terms of exposure. His brightly painted figures and stickers line the stairwells so you get to enjoy them twice. Unless you cheat and use the lift. Among the many weird and largely wonderful pieces inside the AXA building, some have a clear political bent, some protest about the lack of value placed on street art, others contain inspirational or thought-provoking messages. Some are aesthetically pleasing or amusing while others are disturbing on many levels. Among my favourites is Eime’s ingenious use of backlit strips of plastic. The dark red room with twizzling lava-like balls made from builders’ foam was another winner in my eyes, thanks to Godmess. Here’s a small selection of the treats in store. Hazul has been spraying the city’s walls for several years and you’re bound to come across his work as you wander through the streets. 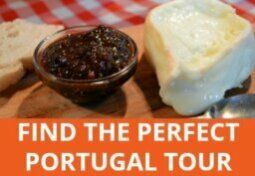 If you’re on the hunt, try the little square near the Clérigos Tower, Rua Miguel Bombarda and Travessa de Cedofeita. I’ve also noticed that several shop shutters have been decorated by street artists. I’m not sure if they’ve actually been commissioned to do the work or are just showcasing their talents but either way, it’s better for everyone than having them covered in graffiti tags. It’s not just shop fronts that are getting a new look. Phone boxes have also been jazzed up, both inside and out, by the likes of Godmess and Costah. Costah and Hazul have also collaborated to create a ceramic version of their Viana hearts called Love Story – Tiles in Town. I found a selection for sale at Águas Furtadas, a treasure trove of a shop in Centro Comercial Miguel Bombada which sells quality, unique artistic creations in various media by Portuguese artists. You’ll find much more interesting souvenirs here than the usual tourist tat. 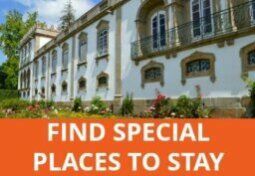 See my tips for where to stay in Porto’s arts district and city centre. *Affiliate link. i.e., you don’t pay any extra but I may receive a small referral fee if you book using this link. 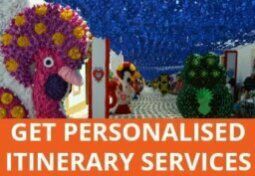 Hi Julie, I’m enjoying using your eBook and blog to plan my upcoming trip to Portugal with my daughter. I am using mostly public transport, but I’m wondering about renting a car for the north. I will be in Porto and the Minho for 5 nights in the middle of June. I have read some negative comments about car rental companies and driving in general. Do you have any advice about this? 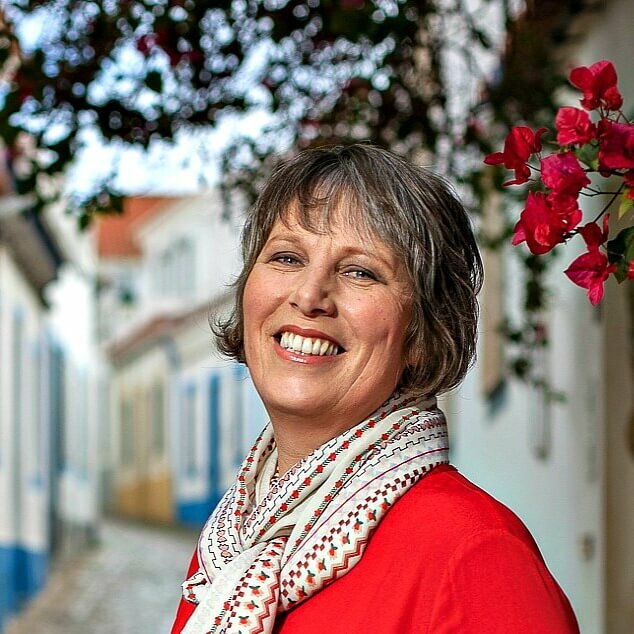 I’ve been following your blog for awhile now, enjoying all the details that are familiar and those that I missed on our last trip to Portugal. I LOVE this country, the food, the art, the history, the culture. Last trip was a six week stay in the northern part, driving in from France through Spain…San Sabastian, touring the Picos, the cities on the way to Santiago, and south to Porto and then across the Duoro River valley and back through Spain and France. Ah, be still my heart. What a trip. Portugal, Spain’s little sister, is still one of my favorite places. This trip completed our goal to tour the full length and width of the country. But pouring over your blogs, I see how very much there still is left. We have to go back! And one stay we HAVE TO repeat is the Casa Sezim. What a pure experience. As a matter of fact, when we were there last July, one of the family members had just died and the funeral was held in the chapel on the grounds. We arrived just as the limousines were arriving with all the elegant friends and family of the deceased. It was all a very memorable experience. Anyway, don’t stop your writing. It is delightful. Thanks for taking the time to share your experience of Portugal and for your words of encouragement. I’m so glad you love Portugal as much as I do and appreciate that there’s always more to see and do. I’ve been travelling here for seven years (not continuously, obviously) and I still feel as though I’ve barely scratched the surface. Wonderful works of art, I love the Viana hearts, very colourful! Street art seems to be in fashion nowadays, and a lot of cities around the world are being “artified”. Thanks, Sami. I for one am delighted to see quality street art being valued and promoted. I hope it’s not just a passing fad but then there’s so much variety and creativity emerging that I can’t see it disappearing any time soon.